Now we understand why the developers still havent released a normal 0.15.0 build with all or at least part of the changes. 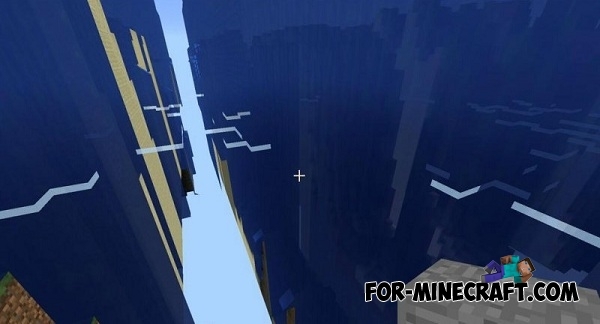 Thomas is trying to move the original height generation of the world in Pocket Edition, and therefore not all functions are realized in full so Mojang have shared only Realms test. As you can see, there was such bug something like a distant land. The main problem - the game will be even more demanding to resources. But we can always hope for optimization. And of course in the world generation settings should be a button which is on / off at the height of 256 blocks. And at last, once again remind you that there will be in the 0.15.0 full version - click to read. Treasure Land updated 2 map for Minecraft PE 0.10.5Long map, which is designed for 1 hour passes. The map was made on the basis of the game "Zelda".